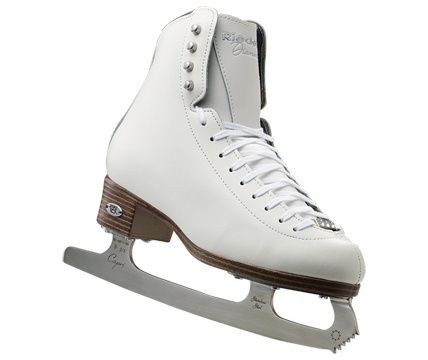 Here you can see the Riedell skates available through The Skater’s Edge. To be sure you have the best skate for your personal skating experience, and to be sure you get the correct fit, please schedule a fitting appointment with us and we will be happy to help you find your perfect skate! The Soar skate from Riedell will put wings on your feet! The bright colors keep your feet stylish and skaters of all ages find this is a great starter skate for their skating lessons or for leisure skating! Boy’s and Men’s models are also available! Riedell’s Diamond will give you the stiffer support you need and comfort you want when starting to learn single jumps. Like the Soar, Sparkle keeps skaters comfortable with a more traditional lace-and-hook fastening and white waterproof boot. Both kids and adults find what they’re looking for in Riedell’s Sparkle. Wish it had a little more pizzazz? Check out the colored lining! For skaters starting to hit their stride, the Stride skate is a great choice for skaters developing through single jumps and into Axels. 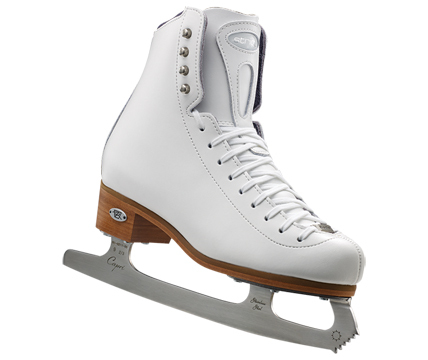 Stride can give your training the boost it needs with an all-leather skate (made in USA!). Adult skaters returning to the ice will enjoy the traditional feel for great value. Emerald is a great skate for someone getting a bit more serious about their skating. With stronger support to hold ankles, and a lovely green lining, Emerald is great for learning better control of edges while still providing comfort.